"Land ahoy!" 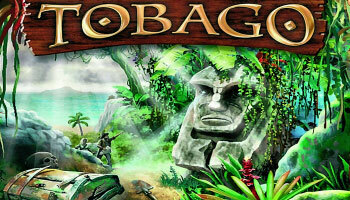 ... After years of searching you hove finally found her: Tobago, the island of forgotten treasures. Your hands hold several scraps of parchment almost too weathered to read, and you would bet your last shovel that these are pieces of a treasure map. But how do they fit? And who has the missing pieces? Only hy gathering more clues will you track down the treasures. Behind the wheel of your ATV you will cross dense jungles, scale rocky heights, and ford raging torrents. But, the moment you arrive at a treasure site, fierce and greedy competitors may lay claim to part of the findings. 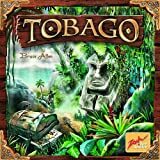 Not to mention the curse of the island that rests on some of the treasures. An inconspicuous amulet is the only protection against the curse's gold-devouring power. 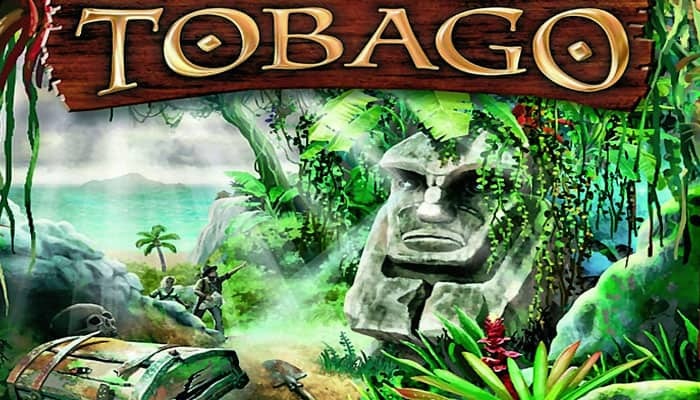 Tobago is an adventure game, in which the players possess different parts of treasure maps. During the game, more and more information about the locations of the treasures are revealed, and the possible locations are narrowed down. When a player identifies the location of one of the treasures, they try to reach it as fast as possible to secure the findings.